« Hype: Tegneseriesalon på søndag! 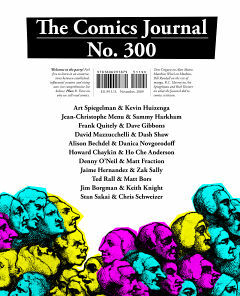 After 33 years of publication, the best magazine about comics, The Comics Journal, now celebrates its 300th issue. Which is also going to be the last in the current format, before the recently announced migration to the web sometime later this month. In short, the printed Journal will be semiannual in the future, with a larger page count, better design (we hope), and less transient content than your average issue of the last three decades, while tcj.com will provide day-to-day news coverage and criticism in the proud tradition of the magazine. While we’re staying tuned for that, the editors have decided to put #300 online in its entirety. A great treat. Go there now and dig into the impressive line-up of artists’ talks: Art Spiegelman and Kevin Huizenga, Jean-Christophe Menu and Sammy Harkham, Frank Quitely and Dave Gibbons, Dave Mazzucchelli and Dash Shaw, Alison Bechdel and Danica Novgorodoff, Howard Chaykin and Ho Che Anderson, Denny O’Neil and Matt Fraction, Jaime Hernandez and Zak Sally, Ted Rall and Matt Bors, Jim Borgman and Keith Knight, Stan Sakai and Chris Schweizer. In addition to that, there are in-depth reviews of Chris Ware’s ACME #19 and David Mazzucchelli’s Asterios Polyp (read the Bunker on them here and here) and contributions by all your favourite columnists, plus yours truly, minus Kenneth Smith. I have written an essay about Moebius’ Hermetic Garage as a constant in his creative life for as long as the Journal has been published and sincerely hope you will enjoy it, if nothing else as partial compensation for posting nothing of real substance here at the Bunker these days of dissertation drudgery. Congrats to Gary, Kim and everyone else who has contributed to making the Journal one of the greatest critical and historical resources in comics for over thirty years! UPDATE: They’ve now withdrawn everything from the website; it is now only accessible to subscribers. Bummer.